I am constantly astounded, and somewhat delighted by, certain authors urge, or need, to expose the most embarrassing and intimate details of their chaotic lives to the scrutiny of their peers and public. Saturated with self loathing, Ames chronicles his bowel problems, sexual ineptitude, ambivalent preferences and progressive hair loss in this superb graphic yarn. Young ‘Jonathan A’ is in love with the idea of being a writer and dreams of living the archetypal life of his literary heroes: hard drinking, drug snorting and sexually promiscuous, but soul is also peppered with a generous dose of anxiety. A classic formula for dipsomania, then and sure enough, Jonathan finds his liking for the buzz of beer takes hold of him early. A sexual encounter with his best friend plants the seed of confusion in his brain and the tragic death of his parents shortly after he graduates from University leaves him alone in the world, apart from his beloved Great Aunt Sadie, a sassy septuagenarian with a liking for younger boyfriends. 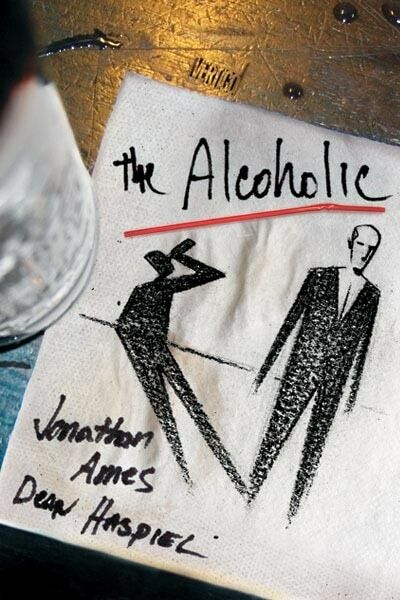 The story follows Jonathan through rehab, long periods of soberness and bouts of drug and booze fueled debauchery. He meets a woman ten years his younger and falls hopelessly in love. She dumps him for a younger man, thereby crushing his ‘heart and his testicles’ and igniting his irritable bowel syndrome. He hits the coke and wakes up on September 11th 2001 in a state of paranoia just as the planes are hitting the twin towers. Ames, who may or may not have written a memoir here- it is not made explicit- captures the fundamental self hatred of the alcoholic well, the temporary relief to be found in alcohol at the price of deteriorating physical health and psyche. He bravely chronicles his problems with faecal incontinence, impotence, and encroaching baldness, so un-macho but yet so blokey. It is a brilliant and enjoyable read, an excursion into vicarious abjection without a redemptive ending, finishing on a note of ambivalence that signals, drunk or sober, the lifelong sentence of alcoholism.